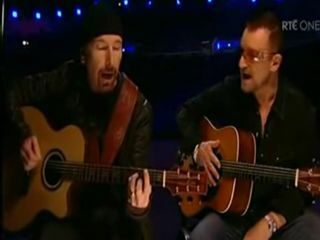 U2 frontman and lead guitarist Bono and Edge have marked the end of the Dublin's Point Depot and the opening of the new state-of-the-art O2 Arena. In a special performance taped at the new venue last week, the two played an acoustic version of Van Dieman's Land, which, somewhat symbolically, was the first song heard at the old arena when it opened in 1987. U2 even filmed part of their 1988 rock film Rattle And Hum at The Point and also rang in the New Year in 1990 there during a series of concerts as part of the Lovetown Tour. The old Point was something of a glorified railway shed, but the new O2 Arena is 21st century all the way, with tiered seating, VIP boxes, impeccable sight lines and a capacity of 8,500 seated or 14,000 depending on the configuration. "This configuration is as good as you'll see anywhere in the world," said The Edge. "I'm sure it will see some fantastic nights to beat anything it's seen up to now." To which Bono added: "And we'd better be one of them..or two...or three!" U2 to make a surprise appearance? Acts are already lining up the play the new O2 in Dublin. Later this week, Coldplay and The Kings Of Leon will play sold-out shows. It is strongly rumored that U2 will even be joining KOL. But hey, it's just a rumor.